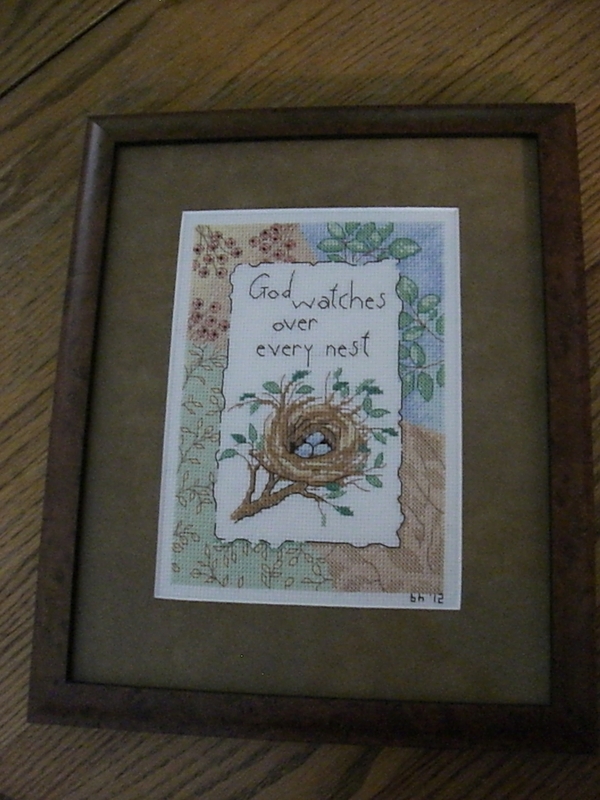 This entry was posted in Books, Christian Life, Christian Womanhood, Decorating, Hidden Art of Homemaking Book Club, Homemaking and tagged Decorating, Edith Schaeffer, Hidden Art of Homemaking by Barbara H.. Bookmark the permalink. So delightful, Barbara! 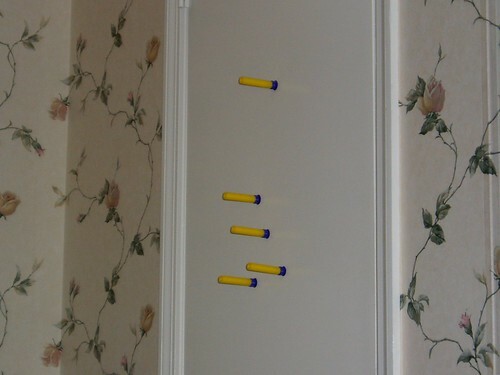 I absolutely love your sons’ ideas of “decorating.” It’s great you shared those. :o) It must be fun to have all those men around. I am glad they let you use pink and roses–even if they did add a dinosaur or a dart to them! Years ago, when we were just about to become missionaries, I asked a lady missionary to help me know what to take and what not to take. She told me to take the “little things that will make your house a home.” I didn’t have much, but I’m glad I did take those little touches to warm up my very gaudily wallpapered first apartment in a strange country. i love how much home means to you. it is something that though i don’t currently experience, i remember from having lived in the same house for my whole childhood. it’s fun to hear you chatting about your ‘place’. thanks for sharing!! 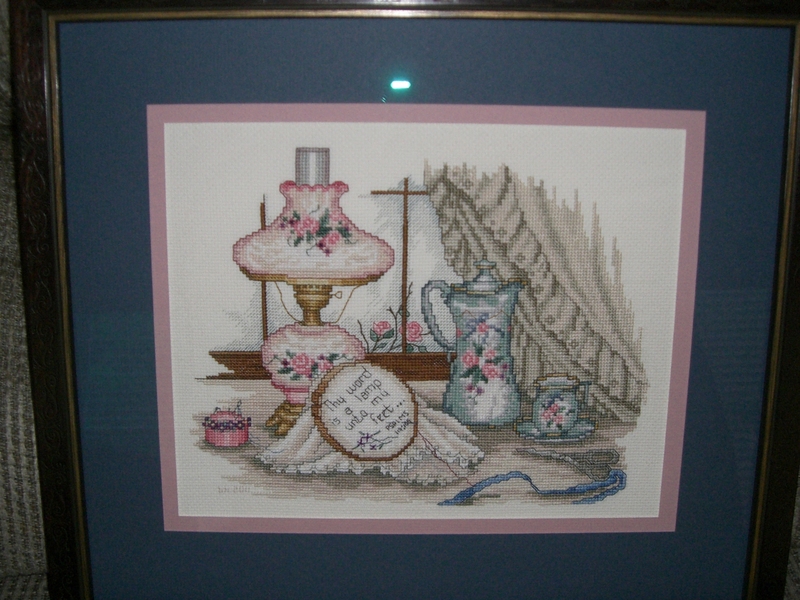 I really liked the cross stitches and your interior decor is lovely. It’s nice to have someone to consult with and shopping together for things like these. I could show almost identical pictures of nerf darts and boy toys intermingled among my things. My favorite is the Star War figurines that get put among all the Willow Tree figurines on the mantle. I always smile and let them stay there for awhile because I know one day they won’t be there! I have a general theme of airsoft going on in my house too, including the permanent ping mark on the TV where someone shot it. It has become a good lesson on grace and the scars of sin. Every time we watch TV it is on someone’s face or in the picture. 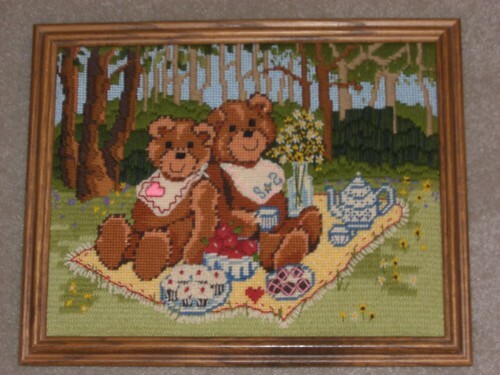 I don’t know where all my old cross stitch stuff is but I sure spent a lot of hours doing it. 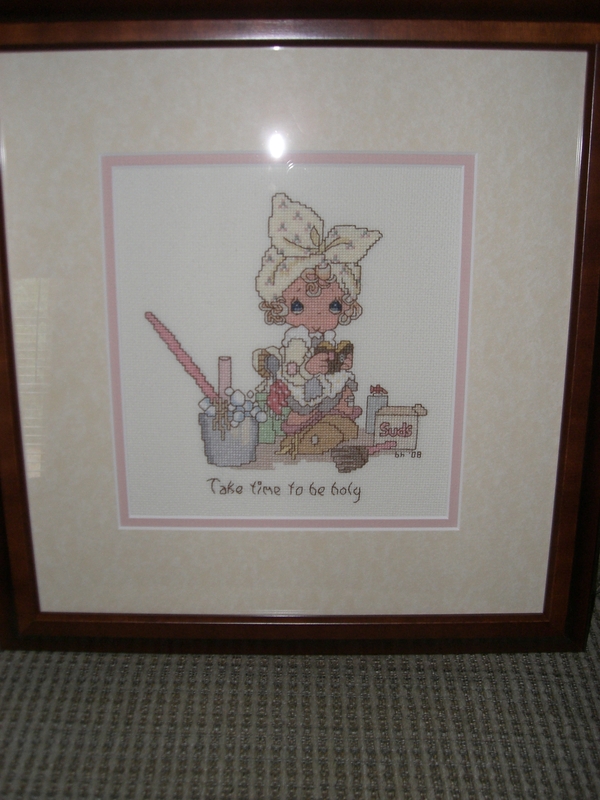 I decorated my first nursery with it. Yours are very, very pretty. 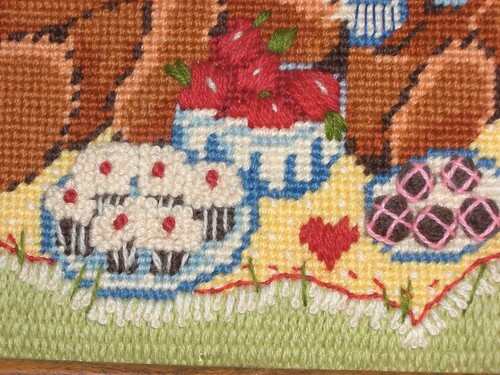 Beautiful needlework! I do appreciate what you said about not storing up things on this earth, or growing too attached to our possessions. I think we struggle more with this in 2013 than Schaeffer’s generation did in 1970. I have hauled around some old family treasures, small ones, for many years, often with no place to put them, so they stay in boxes. But they’re precious to me anyway. The one home we owned where I had space to display everything, and everything came out of their boxes? We only lived there 18 months! God has a perfect plan. Love this post!! I’ve often thought that I’d like to go back to school and take classes in interior design and decorating. 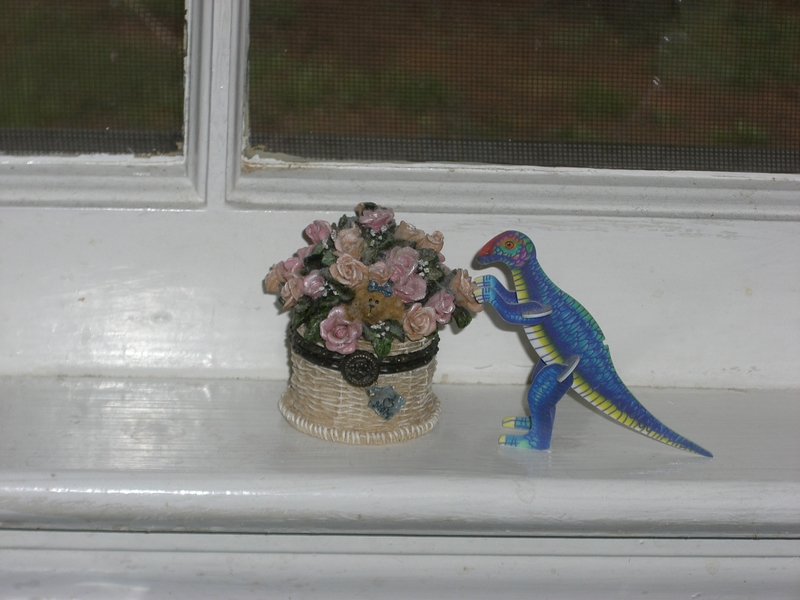 I adore the flowers and dinosaur together. How sweet that you kept it that way. I think we have similar tastes in decorating, and obviously I can relate to being the only lady in a house full of males. I try to tone down some of my feminine influences too but they don’t seem to mind all my lace and flowers. Wonderful post barbara! You’ve addressed so many important issues and summed it all up so nicely. I am finding in this season of my life that what held onto and thought would be important to my children is not so much. I wish I were more selective about what I kept, my cleaning out projects now would be much simpler! I love collections, and I get sentimental about every little possession. Not sure why, but that seems to be the way I’m wired. Working hard at investing in relationships rather then things these days.